HD Craig (No. 3) and Gregg Kolbaba (No. 55) jockey for position during the modified stock car race at Thunder Ridge Motorsports Park Saturday night. Craig won the race. Dirt track racing is still trying to get over the economic hump. 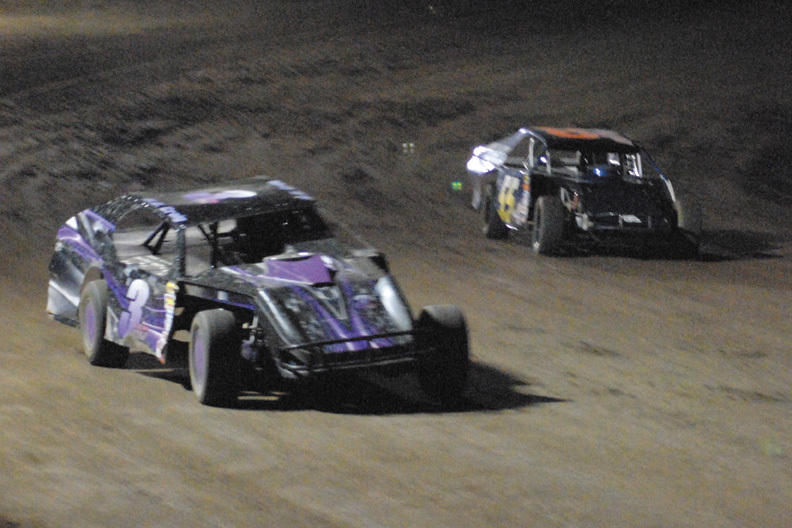 Saturday night was a more successful one at Thunder Ridge Motorsports Park, with 14 cars, five races and large crowds sticking around throughout, but track owner Gregg Kolbaba knows there is still potential for more. The biggest draw for the night was meant to be a race of late model cars, a variety that is more powerful than the hobby and modified stock cars most commonly seen at Thunder Ridge. Kolbaba said he had seven late model drivers who had told him they would be there, but only two showed up. While the late model race was not as busy as hoped, fans were still treated to competitive performances in the hobby stock and modified races, with drivers regularly making passes and contesting each other for the lead throughout. In the hobby stock race, Andrew George of Steamboat Springs took first after starting in third position and making a couple key passes over the course of the 20 laps. The modified race produced a similar result, with HD Craig coming from the back to win. While his late model show did not go as planned, Kolbaba said Saturday was still one of track’s better nights this season.